Welcome to Excel Fencing and Decking! Excel is your number one source in the Greater Baltimore Region for all of your fencing and decking needs. We provide superior service for Cecil, Baltimore, Harford County, Howard and Anne Arundel Counties. As a full service fencing and decking company, we provide the most competitive prices with the highest quality products in the area. We proudly offer Wolf PVC Decking, Azek, Shoreline Vinyl Systems, and Trex products. Excel features a limited lifetime warranty on all of the products we carry. We’ve been in business in Bel Air since 1998 and pride ourselves greatly on customer satisfaction. This isn’t just an idle boast; we never consider the job complete until you’re 100% satisfied. We moved to a new home and needed a fence in our yard for our dogs. Excel provided us with a timely, detailed and fair estimate. They placed a temporary fence for our dogs while the project was completed. The fence was installed as promised and looks great. Charlie and his team were very responsive, professional and went above and beyond to ensure that our project was done right. Would highly recommend without reservations. 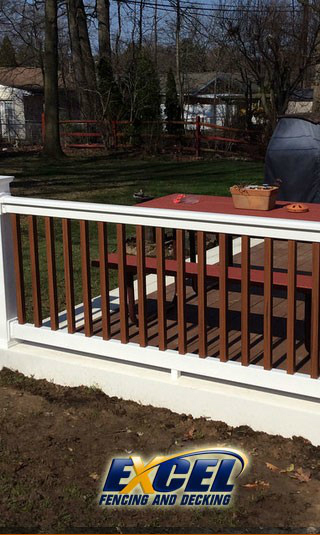 In addition to the areas listed above, Excel Fencing and Decking also services the greater metro Baltimore area. We know there are quite a few fencing and decking companies out there so, to help us stand out from the pack, Excel offers free, no hassle consultations. It’s our policy to give you a fair, accurate estimate and inform you about every cost with no hidden fees or surprises. We believe in empowering our customers to make an informed judgment about our quality, services and prices. Excel also offers other services including sidewalk, driveway and patio installments. We can accent your outdoor pool or recreational area to make it into a private oasis. Our experts will work with you to make the patio of your dreams. Once Excel begins a job, we handle everything including proper permit acquisition. We take great pride in creating an efficient work environment, and we’ll leave your property in pristine condition. When you contract with Excel for your fencing or decking project, you can trust that everything will be done in accordance with municipal codes and done right the first time. Take a look at our showcase gallery, featuring some of our past projects or drop by our ongoing project section to take a look at projects as they are happening. Excel guarantees an amazing transformation of your yard or property, ensuring that your yard will look incredible! Contact us today and let your journey with Excel Fencing and Decking begin! Website Powered by BizMarquee.com, Inc.